An address delivered by IMA President Waite at its first public meeting held at the Great Northern Hotel July 6, 1901. To hold an annual public meeting in memory of Colonel Robert G. Ingersoll, and otherwise commemorate his life, character and work, by the erection of a memorial building, monuments, statues, etc., in the city of Chicago; and by means thereof and through the agency of said organization, to encourage morality, disseminate knowledge, popularize science and education, advance the cause of Free Thought and Secularism, and promote the great cardinal truths and virtues to which his life was most heroically dedicated. After receiving this certificate, the Board of Directors therein mentioned, in order to perfect their organization, met and selected a committee to draft and report by-laws. 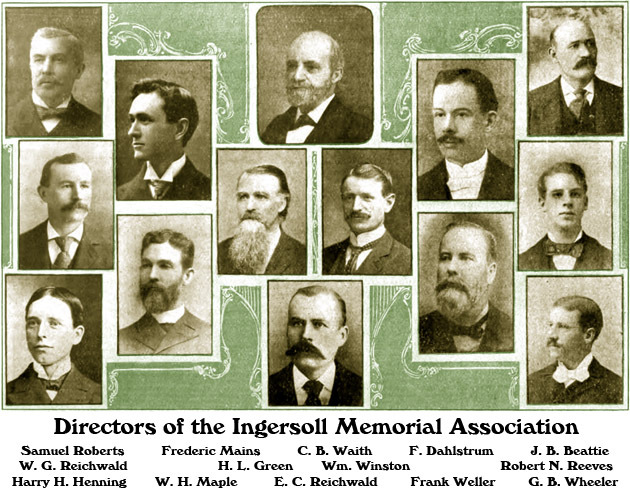 These, after full discussion and various amendments and changes, have been adopted, the officers for the first year have been elected, and we now come before the public fully organized and equipped; proposing, as the first grand project in our corporate work, to build a temple to the ·memory of Robert G. Ingersoll. We “do not say we are going to try to build it—we say we are going to build it. What! 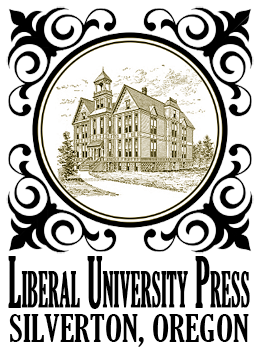 Meet with difficulty in building a temple in honor of Ingersoll? There is money in abundance ready to be poured out for such a purpose, as soon as a feasible plan shall Le presented. Such a plan is now being perfected. In the meantime we ask you to come forward and become members of the Association so that you can give us your advice and co-operation. It is fit and proper there should be an Ingersoll Temple; that it should be in his own State of Illinois, and in the city of Chicago, where he had so many friends, and where the largest halls have so often been filled with admiring auditors, who hung with delight upon his every word. There will be an Ingersoll Temple, and in it an Ingersoll Memorial Hall. In that Hall will Ingersoll’s work be carried forward. Everybody knows what that work was. We have no controversy with those who are trying to give a new meaning to the word “religion.” Words are not things. They are merely the media through which we communicate with each other about things and when that communication is facilitated by giving a word another meaning, then the meaning of the word becomes changed, and it ought to be changed. But it cannot be done in a day. But the word has had in the past a very different meaning, and that meaning is the prevailing one at the present time. The Christian records themselves disclosed that he had sanctioned war and bloodshed, falsehood and deception, cruelty to human beings and to animals, cheating, theft and robbery, murder, human sacrifices, cannibalism, adultery and prostitution, injustice, despotism, polygamy and slavery. And finally he had his own son put to death on the cross, ostensibly to save mankind from his own vengeance; though but a small part of the human race could in any event, get the benefit of the sacrifice. Ingersoll said, “An honest god is the noblest work of man.” Such was not Jehovah: And he protested against a god who had been projected from the brains of an ignorant people in a barbarous age, being made the god of the more cultivated and enlightened peoples of the nineteenth and twentieth centuries. If we must have a god let us have one higher and nobler than Jehovah. 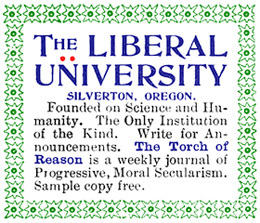 Ingersoll protested and made war against a religion which could tolerate such a god—a religion which sets brother against brother, husband against wife and wife against husband, father against son and son against father, mother against daughter and daughter against mother; a religion whose priests and ministers have in all ages grown fat on the credulity and fears of the people; a religion which places ignorance above knowledge and holds out a premium to hypocrisy; which affords immunity to vice, offering a free pardon for the worst of crimes; a religion which baffles the understanding and sets reason at defiance; a religion which consigns more than nine-tenths of the human race to everlasting punishment for crimes they never committed. Such is the religion against which Robert G. Ingersoll made war; and until every church becomes a school-house and every priest a teacher, that warfare will continue to be waged in the Ingersoll Memorial Hall. We do not expect this work to be carried on by adherents to the Christian religion who admire Ingersoll, for there are such. We appreciate their admiration and are grateful for it; but this work will be done mainly by those who are fully in accord with Colonel Ingersoll in his religious or anti-religious views. And when we shall meet to talk about Ingersoll, we shall not speak with ‘measured words of commendation, in sentences of approval interlarded with sentences of condemnation or excuse, but we shall use unmeasured words of eulogy and praise. We shall come to praise Caesar, not to bury him. For the man whom we shall delight to honor was one whose name and fame will ever grow brighter, as the years roll by.